When you know the facts about lap-shoulder belts on school buses, you will see there are no more excuses to go without them. Myth: Seat belts reduce capacity. Fact: Not anymore. 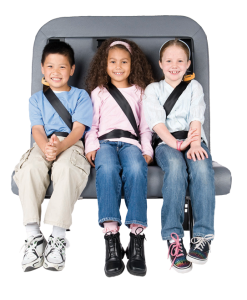 The SafeGuard FlexSeat offers lap-shoulder belt protection that safely transports three elementary age children or two high school students on a standard seat. Fact: Compartmentalization only works when students are facing forward and aren’t in the aisle, and it does nothing for students in a side impact or rollover. 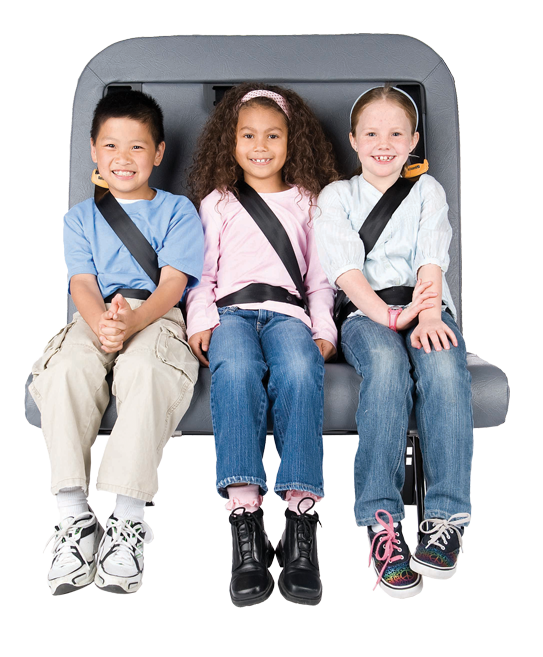 Seat belts help drivers ensure students are seated properly. SafeGuard seats actually offer enhanced compartmentalization with our innovative SmartFrame technology. Myth: Seat belts can be used as a weapon. Fact: Unlike a lap belt which can sit loosely on a seat, SafeGuard’s lap-shoulder seat belts retract into the seat, making them difficult to use as a weapon. 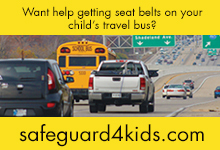 Lunch boxes, backpacks, and books make far more convenient and easy to use weapons than our seat belts. In fact, in more than a decade of use, we’ve never heard of a single incident where our lap-shoulder belts were used as a weapon. Myth: Seat belts encourage students to vandalize the seats. Fact: The opposite is true. Research over the last eight years has shown that seat belts promote a calmer environment and greatly reduce destructive behavior. Myth: Seat belts slow evacuations. Fact: Which children are easier to evacuate? Those who have remained securely buckled in their seats during a crash who can release themselves at the click of a button, or those children who have been flung around the interior of the bus like human pinballs because they weren’t buckled up? The latter students may be rendered unconscious or receive more serious injuries by striking other students, seats, the roof, and walls. Such students would be much harder to evacuate. Myth: They cost too much. Fact: The life of a school bus can be between 12 and 16 years. 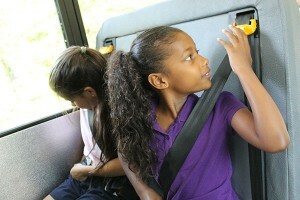 With SafeGuard belts on school buses, it’s only pennies per day. In addition to technological advances and volume increases that have lowered costs, Safeguard belts have never been more affordable. Costs have been reduced by as much as 28% since 2003. SafeGuard lap-shoulder belts on school buses can not only help save lives, they can reduce injuries, hinder bullies, and significantly improve behavior. Students’ lives are in your hands, and a better behaved bus is within your reach. Download the facts vs. misinformation sheet! If you’re considering seat belts, a usage policy is a must. Check out these real-life school bus usage policies!